The "Footprints Nature Club" is a natural sports club specialized in guiding all kinds of outdoor sports and adventures to those who like it and to those who have not yet experienced it. Our mission is simple: to maintain our poistion as one of the best guided tour operators in the country. We assure to do so while enjoying nature, having fun and meeting great people. As we believe that hiking is a mean of getting closer to nature and the perfect way to escape from the work’s stress and the city’s pollution, we made it our main activity within the club. We organize weekly hiking trips to different places in the gorgeous nature of Lebanon for both new and old nature lovers. We are proud to be the first and only outdoors activities club to have a fully functional mobile app, for both Android and iOS systems. You can download the app by searching for "FOOTPRINTS NATURE CLUB" on Google Play or Apple App Store. A very nice trail on LMT section 25, will take us from the amazing historical village of Rashaya to the village of Ain 3ata, and ending in the shrine at Nabi She2et. 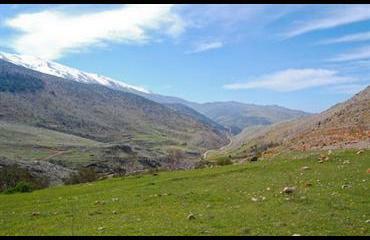 Views of the amazing Mount Hermon full of snow will be all the way on our road.